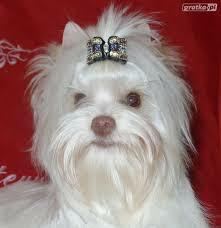 ​"CH Uz von der Elsteraue"
So, Just what is a BIRO Yorkshire Terrier? 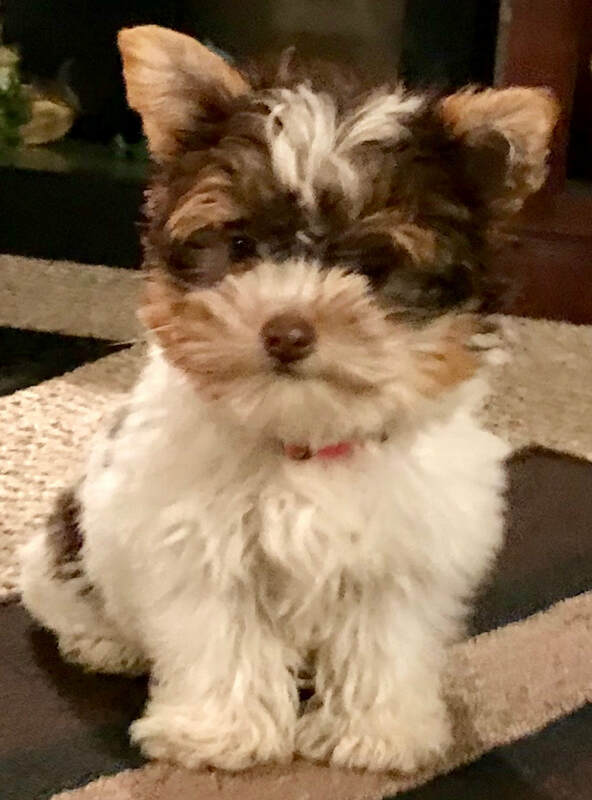 A BIRO is a Chocolate (liver) Biewer Yorkshire Terrier (not to be confused as a variation of the Biewer Terrier) caused by a recessive black gene that is of extraordinary chocolate color. The liver gene affects eumelanin (black pigment) only, that causes the black in the coat to be turned to a liver (brown). It is genetically impossible for a liver (brown) colored dog to have even one black hair in its coat. The BIRO always has a brown nose and hazel amber colored eyes. If one parent is a BIRO & the other is a Biewer and both parents carry for the liver (brown gene) then it is possible to have a litter of standard (white-black-gold or white-blue-gold) Biewer Yorkshire puppies and (white-chocolate-gold) BIRO puppies in the same litter. Two BIRO parents will always produce BIRO puppies. 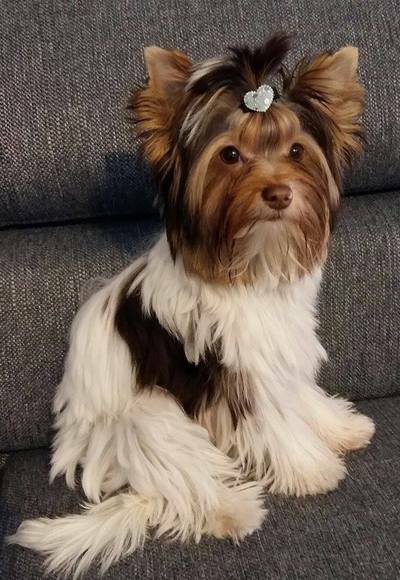 The combination of a dark chocolate color on a white background with gold on the head makes the BIRO Yorkshire Terrier highly attractive and exclusively "rare". At the moment the BIRO is rather small-numbered and one of the youngest breeds not just here in the United States but "all" over the world. It was in the winter of 2004 on December 1st when the first BIRO Yorkshire Terrier puppy was born, a female called "Art of Highclass Relight My Chocolate Fire", to the Art of Highclass Kennel of famous German breeders Roberto Krah and J. Lutz. 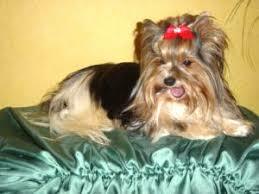 It was this female dog that became the first registered representative of the BIRO Yorkshire Terrier breed in the World. The mother of the puppies was "Alisha vom Wasserschlößchen" that gave birth to four puppies. 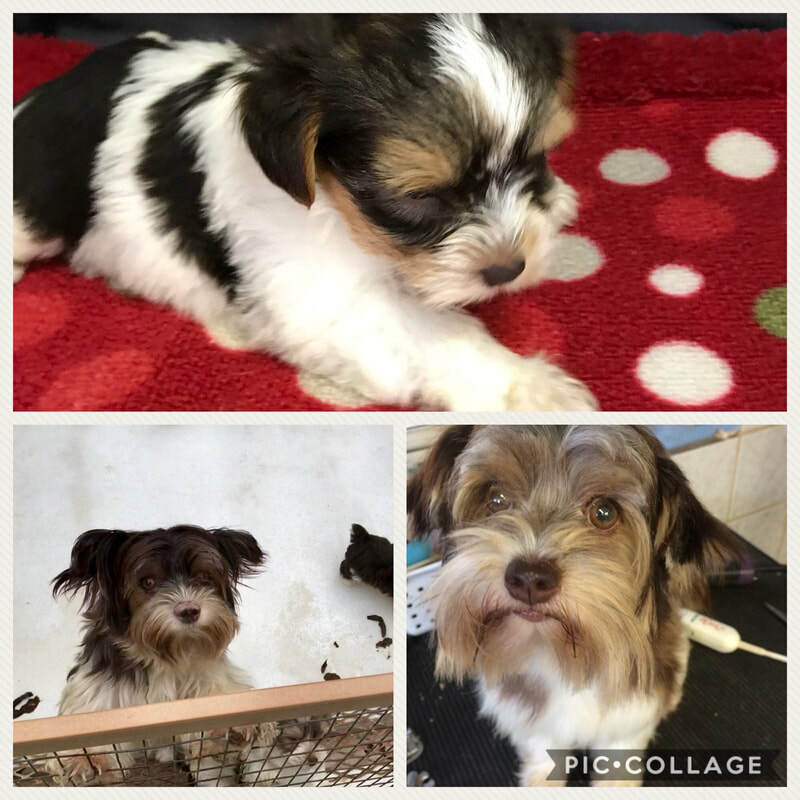 Three of the puppies were Biewer Yorkshire terriers, and the fourth puppy was a female BIRO Yorkshire terrier, who had a chocolate pattern on a white coat instead of the typical black/blue pattern on a white background with a tricolored head. The puppy even had the standard signature golden pattern on the head. 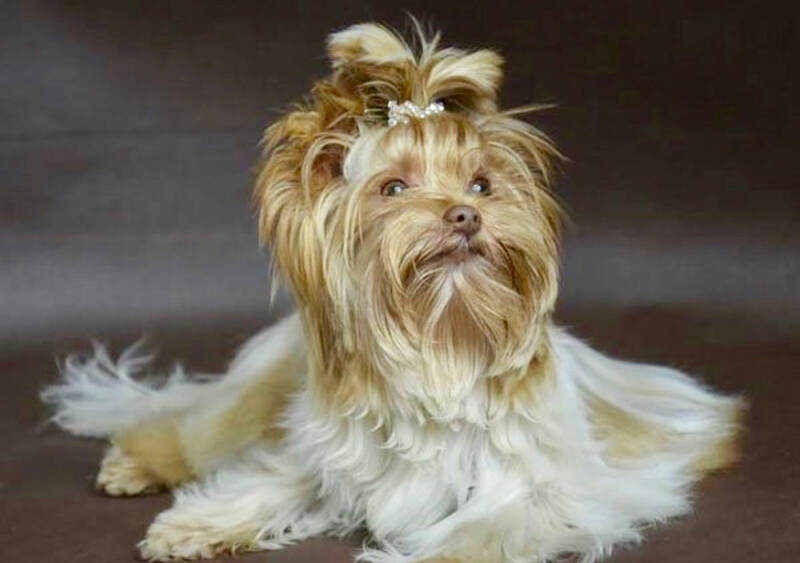 The father of this female BIRO Yorkshire terrier was a famous male dog (which might have been born as a result of the eumelanin gene mutation) called "CH Uz von der Elsteraue" – a champion winner of a great number of awards. Then on January 14, 2005 six weeks later another female BIRO Yorkshire terrier was born in another Kennel, "From the Lightning Showboy” owned by breeders Birgit Rösner and N. Polak. The female puppy was named "Little Princess from the Lightning Showboy". Her mother was "Ailine von Alkotmany" daughter of the already mentioned female, Alisha vom Wasserschlößchen. The father of this puppy was the same, "CH Uz von der Elsteraue". This puppy became the second registered BIRO Yorkshire Terrier breed in the World. 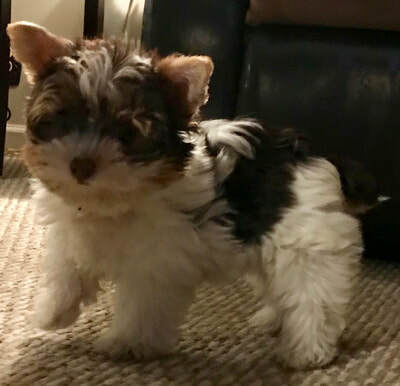 The breeders of both Kennels took interest in the appearance of the new coat color, and decided to continue breeding and strengthening this new BIRO Yorkshire terrier breed. The BIRO breed got its name from the conjoining of the first -initial letter fusion- of both breeders, who developed this breed: Birgit Rösner, “From the Lightning Showboy” Kennel, and Roberto Krah, “Art of Highclass” Kennel. Unfortunately, Ms. Rösner and Ms. Polak stopped their breeding activities some years ago. Therefore, there is only one original kennel left in Germany still today, the "Art of Highclass". 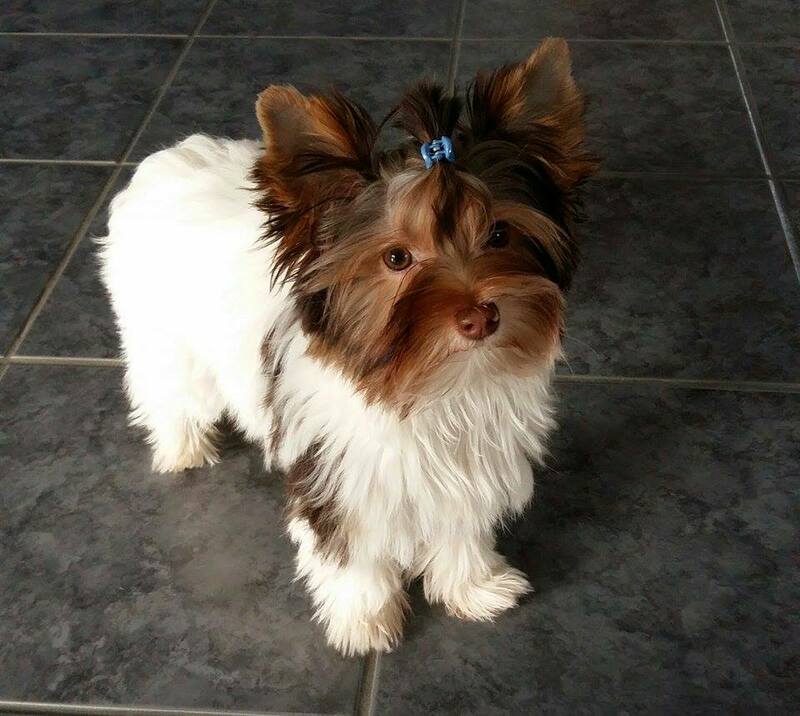 A great support on the way of the breed’s establishment was given by Ms. Dagmar Przystaw (same person of the Biewer Yorkshire terrier)– 1. 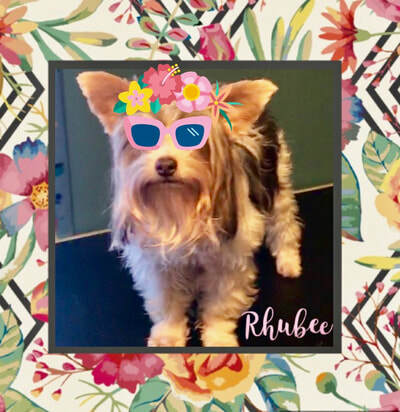 Chairperson of the Dog Friends and Fanciers’ International Club (registered union), and of the International Biewer Yorkshire terrier Club (IBC) registered union, as well as 1. Chairperson of German Biewer Yorkshire terrier Club (registered union), including German Dog Breeders Society (registered union). 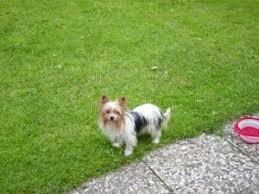 She was the first to accept the BIRO Yorkshire terrier breed in her societies, and she also rendered assistance in its further breeding. At the present time the BIRO Yorkshire terrier breed is popular all over the world, and it is being bred in many countries: the USA, Canada, Russia, Ukraine, Hungary, Czech Republic … etc. The list of the countries is constantly growing. 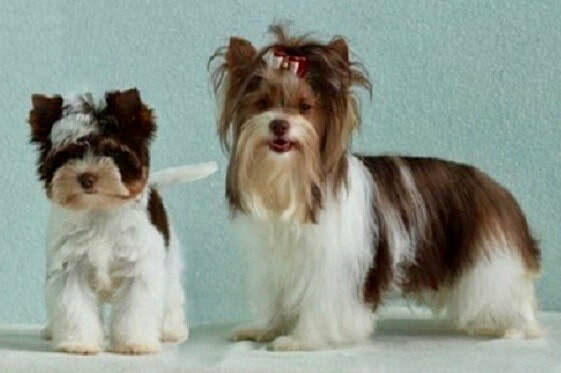 Nevertheless, the BIRO Yorkshire terrier breed, as well as the Biewer Yorkshire terrier breed, hasn’t yet been accepted by the International Fédération of Kennel Clubs (FCI), and or by the American Kennel Club (AKC). Therefore BIRO's can only participate in dog shows organized by clubs and unions, which are not part of the International Fédération of Kennel Clubs (FCI). The BIRO is acknowledged here in the US by the Biro Biewer Golddust Club (BBGC) and is registered by the Biewer Biro International Registry (BBIR). In Germany thru: IHR e.V., ACH, IBC, NHC, and ACH-L. As the BIRO continues to gain in popularity the list of clubs and registries will expand. 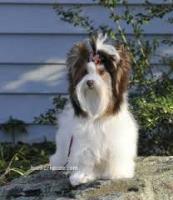 General Appearance: a toy breed whose chocolate and white coat that is long and rich in color is parted on the face and from the base of the skull to the end of the tail is straight and hangs evenly down each side of the body and 3/4 to the floor, neat and compact, should carry his head in such a way to give the impression of confidence and self-importance. Head and Skull: small, and slightly flat on top and not too round. Muzzle: should not be too long. Eyes: eyes (hazel or green) should sparkle with intelligence and the eye rims should be of a chocolate color and not be too prominent. Ears: small, V-shaped, carried erect, not set too far apart, covered with long hair. Neck: good lay of shoulder, not massive. Teeth: scissor bite, level bite. Body: very compact, with level top line, well-proportioned low back and hips, (that is a back that doesn't slope too much from the shoulders to the rump or one that doesn't look humped back), chocolate/white broken without black coloring, no gold or tan, chest, belly and legs absolutely white. Legs and Feet: the forelegs are straight, the hind legs are straight when seen from behind, but the stifles (upper thighs) of the hind legs are slightly bent when seen from the side. The feet are round, paw pads are chocolate and have white toenails. Tail: curved over the body and covered with a long flowing plume. Coat: 3/4 long down the sides of the dog, smooth, straight (not wavy), silky (not wooly), should have a single part that runs from base of neck to tip of tail. Head: Chocolate-White-Gold or Chocolate-White-Tan with a richer gold/tan on ears and muzzle. Top-line: Chocolate, broken or closed, white frill, No gold or tan in topcoat. Legs & Chest: chest, belly and legs are to be of pure white. Tip of tail white. Male animals should have two well-developed testicles fully descended into the scrotum. Faults: absence of the characteristic golden/tan color on the head, any solid color or combination of colors other then chocolate and white as described above. Over or underbite, wavy or curly hair. Any departure from the foregoing points should be considered a fault. Temperament: bold, confident, courageous, intelligent, independent, feisty, affectionate and loves to be with its human companion. Keep the coat trimmed to floor length. Tie back the fall with one bow in the center, or part the hair and tie it back in two bows. 1st registered BIRO "Artois of Highclass Relight My Chocolate Fire"
Mother of 1st BIRO "Alisha vom Wasserschlößchen"
These examples of BIRO are not our dogs.